The 5,000 pencil-size robots will fit snugly inside 10 wedge-shaped petals. Here, one of those wedges is fully stocked with 500 robots, each of which will swivel independently to gather light from a known group of space objects, including distant galaxies. A 45-year-old telescope is going to get a high-tech upgrade that will enable it to search for answers to the most perplexing questions in astronomy, including the existence of dark energy, a hypothetical invisible force that might be driving the expansion of the universe. The Nicholas U. Mayall Telescope in Arizona closed earlier this week to prepare for the installation of a 9-ton device that will feature 5,000 pencil-size robots aiming fiber-optic sensors at distant galaxies. "We started with a conceptual design for the instrument in 2010," Joseph Silber, a DESI project engineer who works at the University of California's Lawrence Berkeley Laboratory, said in a statement. "It's based on science that was done on the Baryon Oscillation Spectroscopic Survey (BOSS) instrument. But it's all done robotically instead of manually." A view inside the dome at the Mayall Telescope near Tucson, Arizona, which will house the Dark Energy Spectroscopic Instrument (DESI). The BOSS instrument, at the Apache Point Observatory in New Mexico, features 1,000 optical fibers that can detect light signals from the dimmest and most distant galaxies. For DESI, the engineers used five times as many fibers. BOSS researchers have to use metal plates with carefully drilled holes to direct the optical fibers toward their targets. For every portion of the sky they want to image, the engineers need to create new plates and mount them onto the telescope. In the case of DESI, the robots will do all the hard work, considerably increasing the speed of the scanning, the researchers said. "There are 5,000 individual robots, and each one drives one optical fiber," Silber told Live Science. "The optical fiber is then routed about 50 meters [about 164 feet] down the telescope to a separate room where these very large and sensitive spectrograph instruments are installed." By measuring how the wavelength of light coming from distant galaxies (or any celestial object) changes, the researchers will be able to figure out how far away they are and how fast the galaxies are moving away. When an object is moving away from us, its light shifts toward the red part of the light spectrum (a longer wavelength), and that's why it's called redshift. The scale and complexity of the map will help the scientists understand how dark energy and gravity have competed throughout the evolution of the universe. Dark energy is the yet unproven force that competes with gravity and causes the accelerating expansion of the universe. It is estimated that the dark energy makes up to 68 percent of the total energy present in the universe. During its planned five years of operations, DESI will measure velocities of some 30 million galaxies and quasars — supermassive black holes surrounded by a disk of orbiting material, according to Brenna Flaugher, a DESI project scientist who leads the Astrophysics Department at the Fermi National Accelerator Laboratory. "Instead of one at a time, we can measure the velocities of 5,000 galaxies at a time," she said. The instrument, a collaboration among 71 research institutions, will capture about 10 times more data than its predecessor, BOSS. "This project is all about generating huge quantities of data," said DESI Director Michael Levi of the Department of Energy's Lawrence Berkeley National Laboratory (Berkeley Lab), which is leading the project. The researchers will use the data in computer simulations of universes. 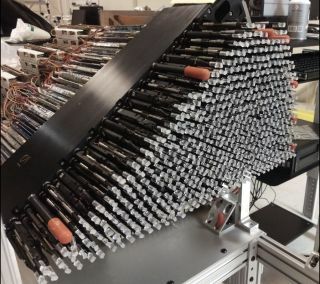 Silber and his team have already produced 3,000 positioning robots and installed them into wedge-shaped petals that will be embedded in the instrument's focal plane. DESI's six lenses are currently undergoing final treatment at University College London and will be shipped to the U.S. this spring so that installation of the components can begin. DESI is expected to perform its first measurements in the spring of 2019.